Two days, one night 18,000 yen. 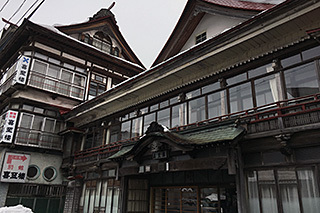 You will stay at Kishiro, a traditional Japanese hot springs inn located in Semi Hot Springs, Yamagata Prefecture. You will love soaking in the various hot baths and enjoy traditional local foods for both dinner and breakfast. 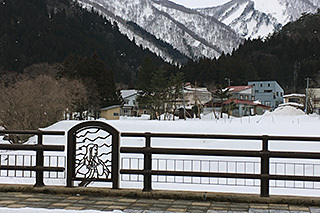 Semi Hot Springs is located in a deep mountain gorge created by the beautiful Oguni River. Your showshoe tour, which follows the river, starts as soon as you have crossed this bridge, the Yoshitsune Bridge, named after a famous Japanese historical character. This is Yoshitsune’s sidekick Benkei. 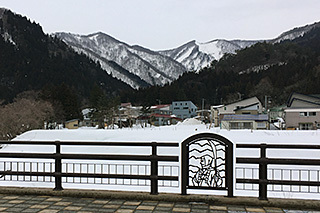 It is said that Benkei discovered Semi Hot Springs in the 12th century while searching for hot water to bathe Yoshitsune’s new-born son. 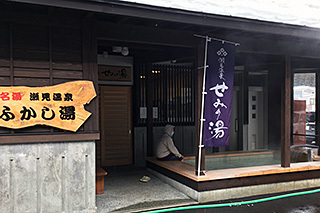 After your showshoe tour, you can enjoy a free hot springs footbath here, just across the street from your inn. Any time during the months of February and March 2017. By appointment only. Please inquire using the form below. *You will be picked up at the station for the short ride to the inn. *Please bring your own snow boots and proper winter wear. If you wish to Make a reservation,Please fill out this section. Where did you find out about this plan? 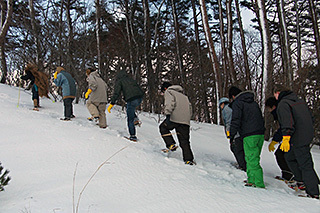 Copyright © 2019 Travel Tohoku All Rights Reserved.